Bow Jerky is the super soft chicken treat your dog will love. Use only highest quality ingredients to prepare a delicious and healthy treat unlike any other. Made with 100% pure, cage-free human consumption-grade chicken. 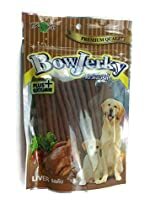 Bow Jerky is the perfect melt-in your dog’s mouth snack for training rewards, sensitive teeth, sick days or all around pampered pets.